I briefly mentioned these last year when I made them but didn’t elaborate. 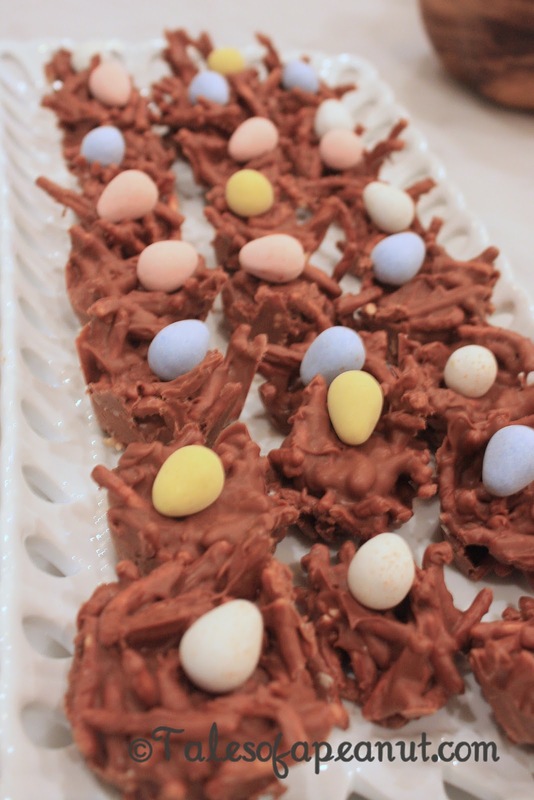 I’m now going to let you in on the best Easter candy secret of all….Birds’ Nests. Y’all. I can’t even begin to describe how good these are. They are super easy to make (take maybe 10 minutes) and will get you some of the best cooking compliments of your life. I’m sure others have known about these for years, but I didn’t until last year when I saw them on Pinterest and now I MUST make them every Easter! You can check out the recipe at The Curvy Carrot. I think some people make these without the chocolate and with other stuff in them (and call them Haystacks), but I’m here to tell you that this is the BEST way to make them. They would be super cute for a baby shower (you could use jelly beans if the Cadbury mini eggs aren’t “in season”) or really any occasion that you can think of. My one tip is to make sure they stay COLD because they tend to get melty pretty quickly when set out at room temperature or warmer. The meltiness doesn’t make them taste worse (maybe even better), but it makes them even messier! I wouldn’t serve them at an outdoor party, for instance, and might only put a small dish out and continuously replenish from the fridge if possible.